The following blog was written by Matt Hoffman, a Managing Partner at Afia who, alongside our CEO Ravi Ganesan, presented the January webinar: Avoid EHR Anxiety with a Change Management Strategy. 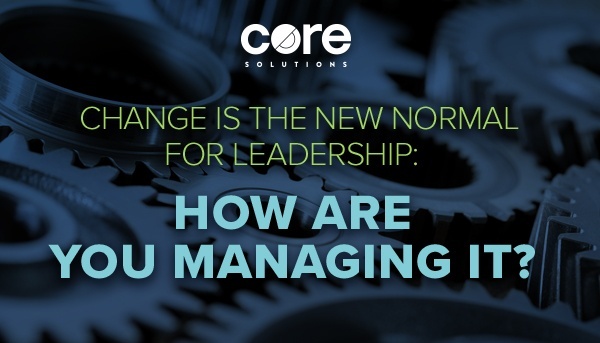 Many insightful ideas about leading and managing complex changes in the healthcare environment were shared during the webinar and have been summarized here. In today’s competitive environment, behavioral healthcare providers are constantly dealing with change – both expected and unexpected. Some of these changes you can control (like quality improvement initiatives) and some you cannot (like regulations). Organizations that don’t evolve risk being left behind. The good news is that the ability to manage change effectively can also become an advantage you can give yourself over your competition. The reality is that the majority of significant organizational change efforts fail. The question is – why? Though some will say having the right technology is the critical factor that determines successful change, our work has repeatedly shown us that there is more to it. In fact, technology is just one of five core competencies that are required to make lasting, meaningful change. Looking at the five core competencies, you can probably think of times where your organization did not account for one or more of these areas. And now, you probably want to forget the frustration and challenges associated with those experiences. The truth is, without these five competencies, your change efforts will be fraught with problems. These can include issues such as canceled projects, schedule delays, cost overruns, or staff turnover. As the visual above shows, if you have all five competencies covered (the top row), you get the change you desire. However, if you are missing one of the five competencies, you end up with problems. For example – if you don’t have proper Governance, you get confusion among your teams. No defined processes? You get sporadic change where some people can make the transition, but others struggle. Looking at technology, you can see why it usually gets the blame – lack of proper technology causes anxiety and frustration, which quickly masks all of the other issues. Once people are frustrated, it is tough to understand why they are resistant to change. Now let’s look at some of our experiences with each competency. Governance can be described as the vision and direction for a project. Building a shared vision is a critical factor in managing change. Without it, we find confusion and lack of cohesion in teams. Creating a solid governance structure should be the first thing that is done when taking on a complex change within your organization. This is strategically important because it becomes the roadmap for you to follow along your journey. For example, when selecting a new EHR your governance team may decide that one of the guiding principles is that the system will create a more effective structure for monitoring consumer outcomes. Based on that concept, all of the systems that are reviewed will be vetted directly against this criteria from the RFP process through contract signing. In this situation, any potential confusion about why a system is chosen or not chosen is removed. The shared vision creates a defined path for decision making, and keeps everyone on the same page throughout the project. To create change, your organization needs the people who will live and breathe the change – to make staff stakeholders and champions of change. 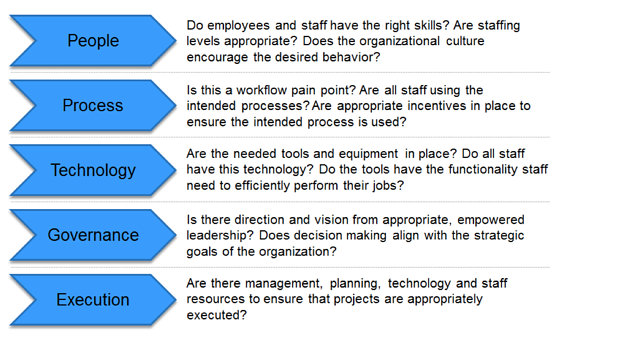 On top of that, the organization needs to create a culture that empowers staff to make the required change. This may include developing their knowledge, expertise, and requisite skills to effectively move the change forward. Without this commitment, organizations will find resistance to change, and staff may work actively against the change. For instance, there are countless examples of organizations that struggle to get their EHRs live because their staff raise concerns, without any corresponding solutions, at every turn. Many times this occurs because the organization never engaged with the staff correctly from the outset of the project. As soon as a major change effort begins, the most effective way to reduce resistance is to bring staff from across your organization into your planning sessions. By doing so, you’ll show them that you are committed to addressing their needs and uncertainties, and you’ll have the added benefit of getting many different perspectives needed to properly plan out major change efforts. 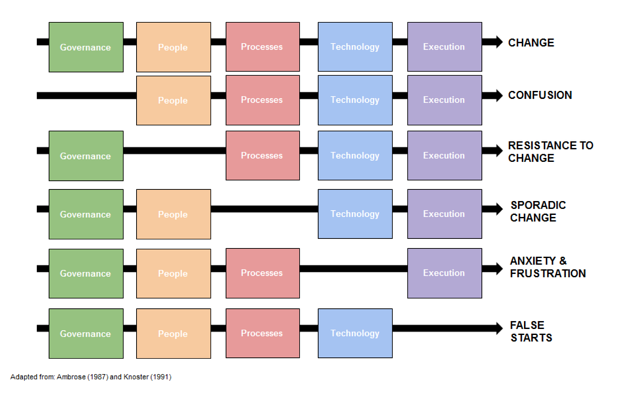 Processes are the workflows and incentives necessary to smoothly and effectively operate an organization’s day-to-day. When change is expected, it is of the utmost importance that organizations spend time thinking about (and documenting!) how the work of every group in the organization will be impacted. Otherwise, decisions on how to change workflow will be left to every individual person and team. This means that every person and team could choose to change their workflow in a different way! Some will find great ways and others will not. In other words, the change will be sporadic. Typical EHR implementations see drops in productivity at go-live of anywhere from 10-30% for a period of months to a year. But we’ve also seen behavioral health organizations focus so heavily on their post-live processes that they saw a ZERO drop in productivity when they went live. This is a significant difference in revenue capture, staff satisfaction, and even client satisfaction. Everyone knew what to do across the organization, and people felt comfortable immediately completing their tasks at the same pace they did before the system went live. Technology can be considered the tools and equipment needed to facilitate change. Without the right products and technology, organizations can expect their staff to be filled with anxiety and frustration. Our best example of this comes from two similarly sized organizations who implemented the exact same EHR. One of the systems was hosted on an infrastructure provided by the vendor and ended up being extremely slow. Staff would attempt to document their services collaboratively with the client/patient, but the system was too slow to do so effectively. They were filled with anxiety and frustration that they couldn’t keep up. As you can imagine, they were not happy! In the second situation, we provided a locally hosted, dedicated infrastructure for the client. The performance of the two systems was night and day, and the staff in this example were much happier with the system. They were able to focus on quality improvement efforts, and consumer facing initiatives, instead of spending all of their time documenting outside of their sessions. Once you have a clear direction in place, your organization will need the resources in place to deliver your desired change. Without adequate execution resources, an organization will experience “false starts” because it will be managing via trial and error rather than having a proven process to deliver. Over the last decade, we have been brought into dozens of projects where there is a clear vision, but the project is stuck in limbo (sometimes for years). The problem in nearly every case is that the execution team did not have the time or skills to tackle the project correctly. Sometimes that means a lot of talk and no action. Sometimes that means picking the wrong vendor and having to start over. In every case, the lack of execution was an expensive mistake. There are two extremely important items that will help define the success or failure of any major project. The first is having the right people in the right chairs. Leading major change efforts take a very particular person. They need to have the personality and skill set to deliver complex projects, but they also need to have the time to commit to the project to ensure its success. This project manager will also need a strong team around them providing the support and subject matter expertise needed to foster organizational change. The second component that is necessary for success is a very detailed project plan. This sounds simple, but most organizations have a difficult time putting a plan together that is detailed enough to be effective. The plan needs to cover every task and dependency. It must have timelines and assigned resources for every single item so that the project team knows exactly what is supposed to happen and when. This is the only way to create the accountability necessary to deliver complex projects. In the ever-changing, competitive world of behavioral healthcare, organizations deal with change on a daily basis. As economic, political, social, and technological change continues to accelerate, competitive pressure will grow. And your organization will need to change the way it does business in order to stay competitive. Ultimately, change is NOT the problem – actually making change is the problem! And while it’s difficult, it can be easier once you know what to look for. Time and time again, our experience shows that a lack of focus on the 5 Core Competencies of Change spells trouble for a project. By properly accounting for these competencies and planning for them from the start, you will set your organization up for success. Remember that it is critical to look at people, processes, technology, governance, AND execution. If you only focus on one or two, problems in the remaining areas will still be there under the surface – like an iceberg ready to sink a ship!